Stainless steel x-pipe valvetronic exhaust brings out the tenacity, the strength, the speed and continuing the tradition of excellence of Ferrari. 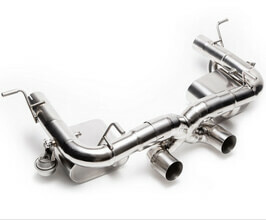 Free flowing design with exhaust gases efficiently moved from the engine to the exhaust tips. A diabolic sound fills the air with uncompromising power. Arm yourself with this revolutionary technology for a smarter driving experience. Valvetronic system introduces a new dimension of versatility; never compromise between sound and stealth. ARMYTRIX exclusive OBDII dongle system reduces install time by 50 percent! Exhaust tips not included.